Home > Collector Items > 31" Bali Garden Rooster: "Erich"
31" Bali Garden Rooster: "Erich"
Meet Erich, a magnificent metal rooster from our Bali Garden collection. 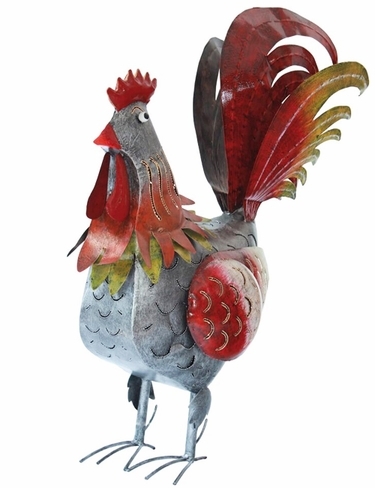 This metal rooster bring a tremendous amount of whimsy and extraordinary design into any home and garden. His colors and design are great, as are his reserved posture and suspicious eyes. At a large 31" tall, you'll love Erich, by far our favorite Bali Garden Rooster Bird! These high-quality Bali Garden Birds feature cheerful and colorful designs unparalleled. Each bird is meticulously crafted exclusively by hand and promises to bring a tremendous amount of youthful fun and extraordinary whimsy into any home and garden. Made from sheets of steel, welded, buffed, sealed, varnished and then painted these metal birds are as strong and sturdy as they are beautiful. An optional stability ground stake is also included for outdoor use. As if this amazing design needed more, a secret compartment inside the body under the wing allows this metal bird to be lit up from the inside with tea candles or strings of LED lights too! This added flair can create a magical glow for extra evening enchantment on the terrace, in the garden, or in the home. Beyond unique and absolutely incredible is the only way to truly describe this spectacular Bali Garden Dancing Bird! Bali Garden decorations are made from steel metal sheets that are bonded after shaping using an autogenous welding process. Following de-burring and buffing, the pieces are primed in an immersion bath so that all the interior and exterior cavities are sealed. After drying, the garden decorations are varnished in a second step with a spray gun, before the surfaces are painted elaborately and intricately by hand in the familiar Balinese colors. As a result of this complex fabrication process, these items should retain their bright finish forever indoors and for many years outside in most weather conditions. We do recommend bringing these birds indoors during brutal winters as frost can damage the overall attractiveness. As with all items, you can use SunGuard UV Protectant to extend the life of all your outdoor products! These items are handmade works of art, and while each retains the magnificent structure and design elements, subtle variations in paint color and pattern are expected through the nature of the process. Each bird is 100% unique! Click here to view the entire Bali Garden Collection.